I knew I would enjoy this novel from the very first sentence, and I was not wrong. I thoroughly enjoyed my time in Poppy Hammond's world. Yes, she was a bit presumptuous at times, but what a great character--I love how she took charge of her life. Then there is Sebastian, whom I adored (maybe even had a little crush on). A little about the book, set in 1920: Penelope "Poppy" Hammond, step daughter to a wealthy industrialist, ditches her stiff groom on their wedding day, enlisting the aid of Curate Sebastian Cantrip. They flee to Poppy's father's country village home in England. It is there that Poppy reflects on her life thus far--how little she's accomplished and how often she's failed to follow through. Deciding to change that, Poppy is determined to return to London to find Sebastian Cantrip and thank him for his help as well as maybe find herself a little adventure. And adventure she finds in spades! For the mysterious curate is not who he says he is--nor is he where she thought she'd find him. Poppy, along with her lady's maid, Masterman, begin their own investigation into the identity and whereabouts of Sebastian. Their adventure takes them from the ports of London to Damascus and the deserts beyond. There is intrigue, treachery, romance, and danger at every turn. Poppy is quick witted and intelligent. She is ever tenacious. Her wealthy upbringing showed a few times, her privilege and class being both a hindrance and a help. I especially enjoyed the references to the political and social turmoil in Damascus and among the Bedouin tribes throughout the novel. As well as the descriptions of the city itself. Damascus was very much a character all its own, as was the desert. There was a romantic air about it and a dangerous one. There is humor throughout the novel, and I found myself laughing as often as I found myself holding my breath in suspense, waiting to see what would happen next. This book wasn't quite what I expected in that I expected more romance and less adventure, but the level of adventure and intrigue was quite high. I liked how the romance progressed through the novel--more of a slow tease and less of an "in your face" type. While things may fall a little too conveniently together in the end, this did not bring down my enjoyment of the novel in any way. It does make me anxious, however, to read City of Jasmine. When I first volunteered to read Night of a Thousand Stars, I had no idea it was a companion book to another that features some familiar characters. My only quibble with not reading that book first is that I did not get to experience the excitement others did about running into those familiar characters again. Just the same, Night of a Thousand Stars is perfectly fine as a stand alone, and, I feel, nothing is lost in reading them out of order or even just one or the other. I look forward to reading more by Deanna Raybourn in the future. I can see why she's such a well-liked author. To learn more about Deanna Raybourn, and her books, please visit the author's website. 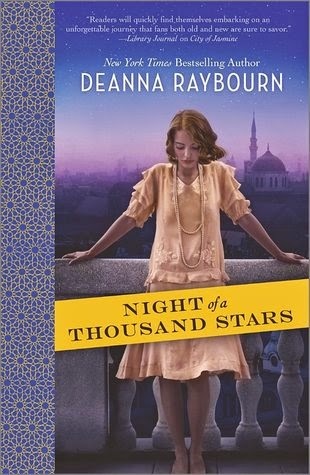 I hope you will check out what others had to say about Night of a Thousand Stars on the Historical Fiction Virtual Book Tours route! This sounds good! I like reading romance with some adventures in it. Melody - I really enjoyed this one, much more than I expected. It was such a fun read. I love that time period and don't mind an ending like that from time to time. This sounds good to me! Kathy - I love that time period too, Kathy. And agree about endings like that. Sometimes they are exactly what I am looking for. I'm glad to know that this reads well as a stand alone. I've really enjoyed the previous Deanna Raybourn's I've read and I've had this sitting on my Kindle for awhile. Definitely sounds like I need to read it! Plus I can never resist a book set in the 20s. Katherine - I had no idea there was a prequel. I definitely want to read it though. I hope you enjoy this one when you get to it, Katherine. It was a fun read! I've wanted to read something by this author for a while - it just never seems to be the right time. Hopefully soon, because her novels always sound great! Elizabeth - I'm glad I finally took the plunge and gave her a try. I imagine I'll be seeking out more by this author in the future. Its great when as happened here you get into a book right from the beginning. Intrigued by the mention of the Bedouin tribes, not a people I know much about, I'll be sure to keep a look out for this. Tracy - I love it when a book pulls me in right away. Reading about the political climate in that area was fascinating--and would like to read more about it. Given this is more of a light adventure/romance novel the author didn't get too deep into it, but what she did share was interesting. I've been wanting to try this author for awhile so I'm glad you liked it. I think I have the first of he other series waiting on my shelf. Stacy - I definitely want to read more by Raybourn. This was such an enjoyable read.